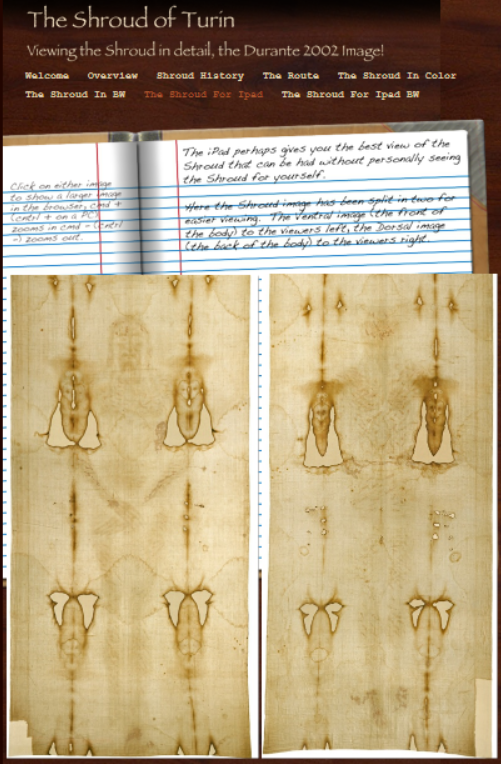 Joe Marino by email and Emanuela Marinelli in a posting to the Holy Shroud Guild Facebook page alert us to “Beautiful free Shroud pictures!” for your iPad. Just load The Shroud for iPad in Safari or Chrome and click on the front or back image. Then zoom away with finger and thumb actions. These are the Durant pictures, by-the-way. BUT you can see these images in a regular browser on a laptop or desktop computer. And you can zoom them. With the Chrome browser, I can zoom them up to 500%. Because I am running Windows 8.1 with a touch screen on a laptop (an early Fathers’ Day present) I can zoom or unzoom the pictures in exactly the same way with thumb and finger and drag them to and fro. Fantastic! I just tried to do this thumb and finger zooming in Shroud Scope. Wow! Fantastic! I have just done a seven second comparison to the iPad app Shroud 2.0. I like this better than the app (which has all those annoying watermarks all over the image). But then again, Shroud 2.0 has some good features and much better high definition based on scans of the shroud. It is a matter of what you want at any given time. Very nice. On my desktop, the image scaling in over 7.5X.